The global bisphenol A (BPA) market is estimated to witness a CAGR of approximately 6.5% during the forecast period. 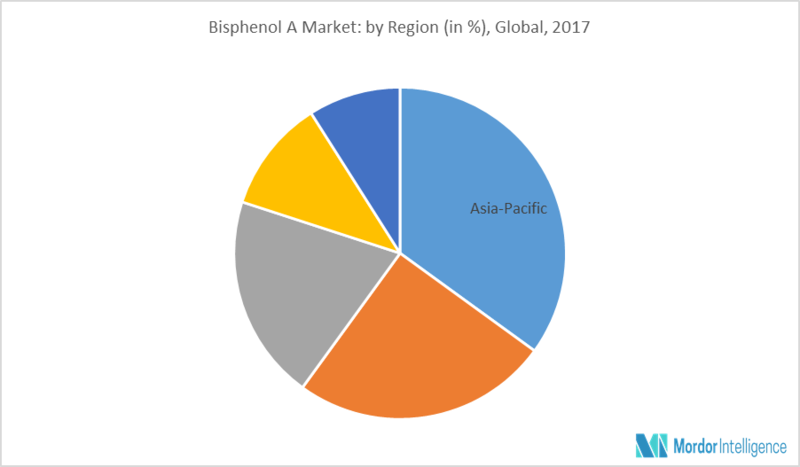 Asia-Pacific holds largest share of the bisphenol A market. The market is projected to be driven by the increasing demand for polycarbonate and epoxy resins in various end-user industries, such as paints & coatings, adhesives, electrical & electronics, packaging, and others. With several studies, it is found that BPA application in the plastics used in food containers, baby toys, water bottles, etc. can cause health hazards to babies, as well as adults. The studies revealed that use of BPA-based products in such products can cause variety of health issues, from prostate cancer & breast cancer to early puberty, decreased fertility, neurological problems, and changes immune system. With all such increasing concerns among the consumers, the demand for BPA free products has started increasing, which is likely to serve as a restraint for the market. Major Players - Convestro AG, DowDuPont Inc., Mitsui Chemical Inc., SABIC Innovative Plastics and LG Chem Ltd., amongst others. 9.2 China National BlueStar (Group) Co, Ltd.
9.13 Shanghai Sinopec Mitsui Chemicals, Co., Ltd.